There’s few things in life I go anywhere without. Since September 2006 you can also add a 60gb video iPod to that list. In my pocket, in my bag, in work, in the van, on a bus, on a trip to Canada, on a trip to Germany – wherever I went, the iPod followed. It had been a month since I’d seen it. I’d used the iPod (as I always do) in setting up the rig for the night, check sound levels, quick pan left and right and put it away. Collecting the gear the next morning, I grabbed the iPod, put it into the van (or at least thought I did) but it never made it back to Kilkenny. Any boxes, bags, anything small enough to hold the device have long been emptied. Hell, even at the weekend I unscrewed the lower panels in the back of the van just in case it had some how slipped in behind them. Flash to Monday of this week and I was hovering with my finger over the publish button on this post, which ultimately had a different outcome. In Monday’s post I would have talked about how the iPod was an extension of my being. Like a lost puppy it followed me absolutely everywhere – gigs, walking around town, working out, around the house, in my camera bag, in work, in the van, never leaving my side. I would have talked about how strange it is to get attached to a digital device. I’ve had phones I’ve loved, laptops I’ve loved but when something *just works* and shows no sign of needing an upgrade or update, provides great battery life (through care), hasn’t a mark on it (bar some wear on the back) and does everything I need it to do, then obviously I’m going to get attached to it. 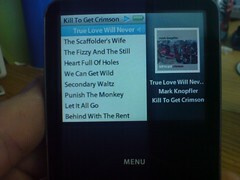 That said, this is the iPod I upgraded the firmware on. Plus at the time, it was a considerable investment, breaching the 450 euro mark (yes, in typical Apple fashion it wasn’t long before they announced the 80gb slim models but there you go…). Ever since the secondary school days I’ve had some form of portable music player sitting in my bag – hell even go back to primary school days where I would accept sitting through slower renditions of my favourite songs because the batteries in my walkman weren’t totally depleted. Walking to work in Waterford my minidisc would sit happily in my pocket. On the bus home from college by Creative Zen Jukebox would provide me with some musical interludes between conversations. But in the 18 months I’ve had my iPod it never left my side. Yesterday I would have talked about how it was time to look for another iPod. I didn’t necessarily need wifi, but maybe it would be interesting. I didn’t necessarily need to go to a 160gb classic model, but maybe the extra space would come in handy some day. However, I had also resigned myself to the fact that replacing my iPod would, in the present climate, have to take a lower priority on the list of things I’ve got lined up. Plus, if I was going iPod touch route I’d certainly try and organise something overseas rather than pay Apple’s silly exchange rate where US$1 = â‚¬1. Rummaging through a bag of XLR cables needing to be repaired on Monday (and stuck with a tube of masking tape around it) the mourning of a device turned to sheer joy. Battery drained, marked up from the tape (comes of with cleaning) but a full charge via USB and the world is back to normal. I think I’d been physically upset at losing the iPod, such is my attachment to it. Or at the very least angry with myself for having misplaced it to begin with. How it ended up in the bag is beyond me as I certainly didn’t put it there – I wouldn’t mind only I’d been through that bag before and had it out at two gigs since. At least now I can empty iTunes of all the podcast content I’ve downloaded.